Farmers work late into the night to get harvest in. It was a hot late August evening. 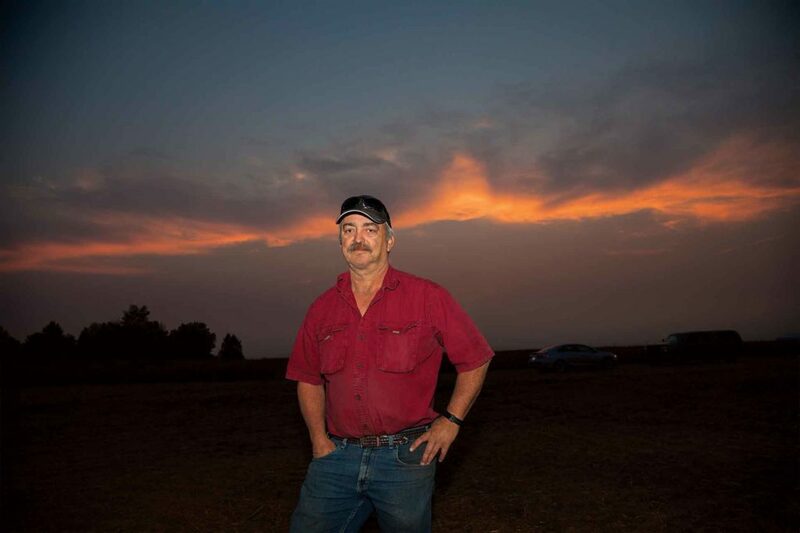 There was a half-hour to go before sunset and Roy Klym’s four combines were already starting to groan with the strain of threshing a 70-bushel yellow pea crop in the rising humidity. The wind had nearly quit in his fields on the northern outskirts of Regina, Saskatchewan; there wasn’t enough air movement to dissipate the dust clouds. Only the very tops of the hoppers were visible. Sometimes, the dust was so thick the operators could hardly see the edges of the headers. A lot of romanticism has built up over the years around combining far into the night to get crops into the bin ahead of the weather. Harvesting into the early hours produces classic man-against-nature stories to tell in the coffee shop. But while all cereals, small grains, and cash crop producers occasionally will thresh until the wee hours of the morning to beat a threatening storm, few do so very often. They know that if they aren’t rained out, they’ll be right back at 7:30 a.m. to start servicing before another day of combining. Neither combines nor their operators are designed for indefinite 18-hour workdays. Harvest is a marathon, not a sprint, at Klym’s farm, RoLo Farms near Regina. 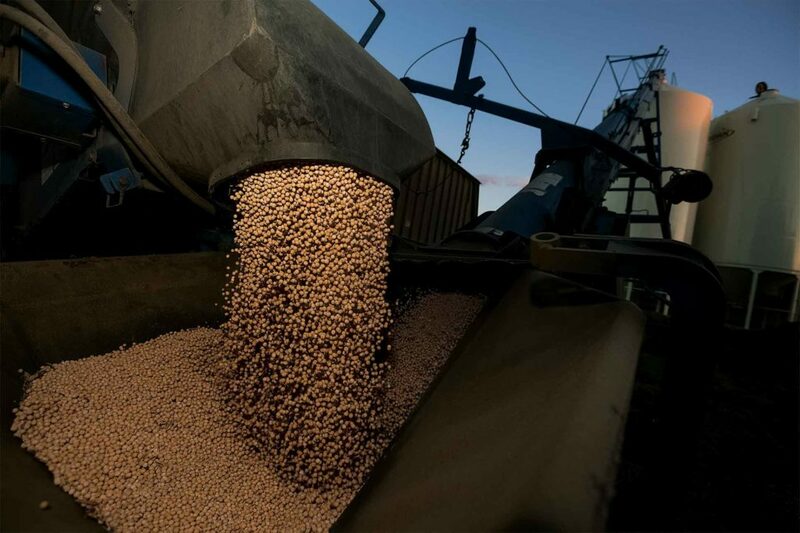 It typically takes from mid-August until mid-October to get the spring wheat, durum, canary seed, canola, lentils, field peas, and soybeans they grow into storage. As certified seed growers, the Klyms make sure to thoroughly clean their machines every time they switch varieties or switch crops to prevent any cross contamination. While it’s possible to light the area around a machine as bright as day, the shadow effect stresses some operators. Every year tired equipment operators are injured (and occasionally killed) in falls from equipment or bins. They cause cart and header collisions, run over grain handling equipment, and cause breakdowns by being too rough with equipment. It’s stressful enough trying to finish harvest without having a machine down for repairs on a beautiful day. Good yard lighting around the bins to make unloading easier matters too, Klym adds. They’ve also equipped every bin on their farm with a level alert. These float-like devices allow the trucker to know from the ground when there is only a foot or so of space left in the bin. It avoids forcing people to go up and down ladders to check with a flashlight to see how full the grain bin is. Visibility matters. 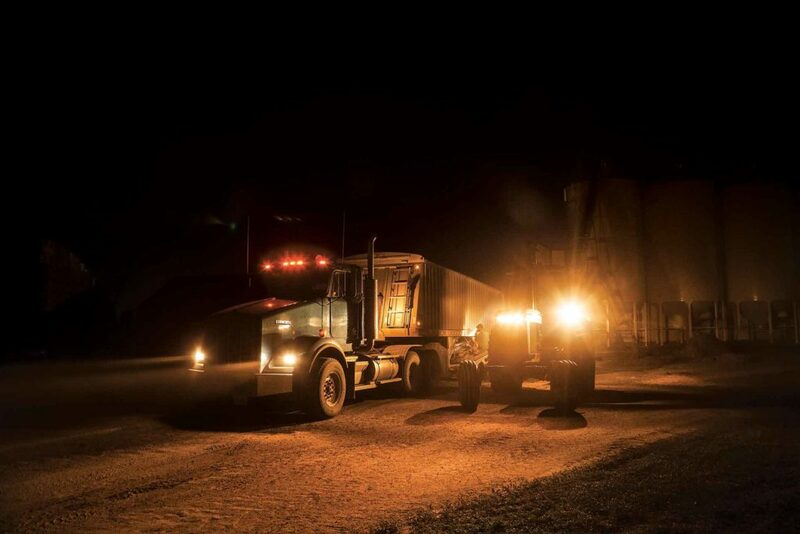 It’s hard to believe that only a decade ago, drivers would be stumbling from the combine cab at the end of a 12-hour day, exhausted from the mental drain of running the machine. But the widespread adoption of GPS-based autosteer and automatic height control systems in the early 2000s has led to a huge reduction in operator stress since it’s no longer necessary to devote so much attention to where the edge of your header is. However, you still have to know what’s happening around you. All of Klym’s bins are equipped with bin floats so it’s not necessary for someone to climb a ladder to see how full it is getting. Most people today are dealing with larger acreages and want to maximize their huge capital investments in machinery, but it’s still important to take a strategic approach to harvesting decisions, Bessel says. Keep in mind your capacity to combine after sunset is physically limited by how rapidly humidity builds to the point it’s impossible to thresh. This varies by local climate conditions, the time of year, and the type of crop being harvested. Farmers located close to a mountain range or a large body of water for example have to call it a day much earlier than ones who farm out in the middle of the windy Saskatchewan flatlands, Bessel says. Likewise, Prairie farmers can harvest much later in the day in August or early September, when the air is warmer, than they can later in the season. 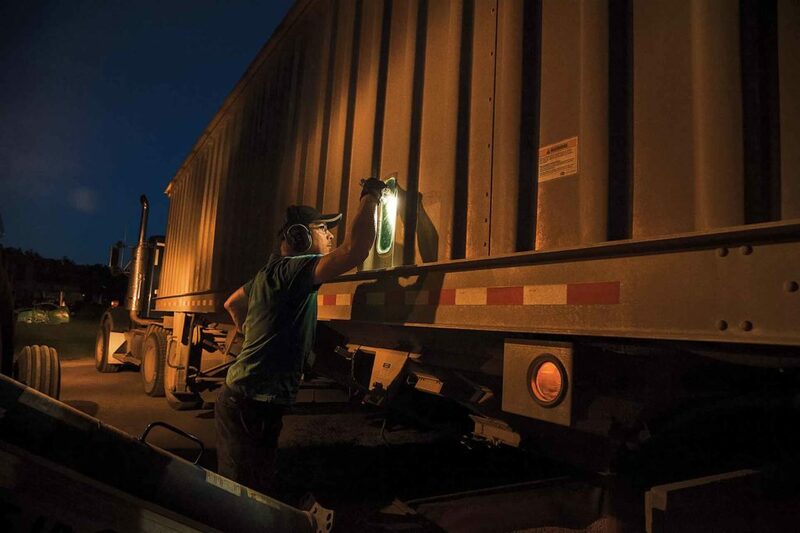 Rick Shiplack uses a flashlight to check grain levels in the truck. Humidity variations during the day affect the crop’s biomass, and that, in turn, affects how easy it is for the harvester to separate the seed. So the optimal combine settings for a crop will vary as the day progresses, too; a setting that produces minimal losses at 2 p.m. might cause huge losses at 8 p.m.
Getting down on your hands and knees to blow chaff out of the way while counting the number of seeds you find was the old school method that farmers used to determine what their losses were. Others though just drove behind the combine and tried to determine how many seeds were bouncing off the windshield. Bessel says none of these are likely to produce very accurate results, especially with a small seeded crop like canola. hour, he says it’s pointless to keep pushing operators. Productivity versus efficiency. It’s tempting to try to maximize your productivity at the expense of your efficiency, Bessel explains. It comes down to finding the sweet spot where you harvest the maximum number of acres per hour that you can before you start sustaining too high of losses. This isn’t a hard-fast number because the definition of an acceptable loss versus what is going into the tank changes is tied to grades. Tennessee farm guys scale down a giant operation.